Taunton Rugby Club is proud to bring together players from ages 5 to 18, from all over Taunton as well as its outlying villages and towns. Players start their journey as Rascals, continuing through the Mini and Midi age groups (U7 to U12), then on to the Junior age groups (U13 to U16) where many get the chance to be part of the Bristol Bears Academy. Colts (16-18 years old) is our final youth team, where they encounter competitive league rugby for the first time.Taunton RFC has a very strong youth section, which has seen some of its players achieve their dreams, whether that be playing together with friends through the years, forming lifelong friendships or playing for the Titans or even beyond to Premiership or International level! Former Taunton Youth alumni currently achieving their dreams include amongst others Joel Conlon (Saracens), Will Vaughan (Bath), Kieran Verden (Bath) & Joe Snow (Exeter Chiefs). Taunton Rugby Club have had links with the Armed Forces since opening its doors in 1875 and are extremely proud to support the Armed Forces Covenant and honoured to have received the Silver Award. 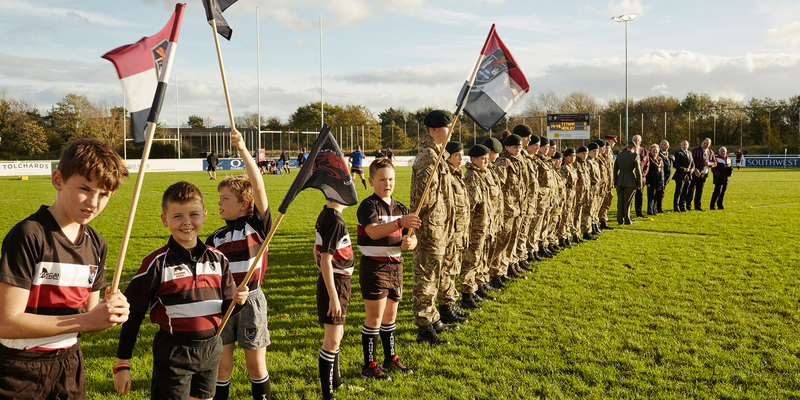 We hold an annual Armed Forces Day , giving free access to a Titans home match to serving forces personnel and veterans and support the Cadet Forces Community engagement programme. We also hold an annual remembrance service at the stadium.